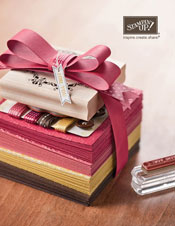 Playing with Papercrafting: The New Catalogue is Here! Today is the first day that you can order from the new 2012 - 2013 Idea Book and Catalogue. I know you're going to love all the new products. The layout is a little different, but clearer, I think. I put in an order for a new paper cutter! I'm so tired of the blades of my old one getting dull and ripping the paper. It was so old that I couldn't buy replacement blades for it anymore. My up lines all recommended the table top cutter - guillotine style - because of all the cutting one has to do as a demonstrator. I also ordered one of the new heat tools. It is new and improved with two heat settings! You can download the new catalogue with one click here! Make sure you check out the newly redesigned "Firm Foam" Classic Ink Pads. I am a big fan of them. 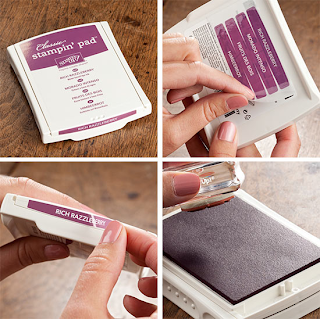 So much easier to ink up your stamp completely. There is so much more exciting news from Stampin' Up today. First, if you book a workshop in June or July, and your party qualifying order is $575 or more (excluding shipping and taxes), Stampin' Up is giving you another $60 to add the the $90 plus 1 item at 50% off! Wow! That's a total of $150 plus 1 item at 50%. You can spend those Hostess Dollars on anything in the Catalogue! How great is that? You could earn a Big Shot if you wanted one! Contact me to book a workshop in June! And if that wasn't amazing enough, if you have decided that you want in on all the demonstrator benefits: discounts; preorders; bonuses and more, there a new low price of $125 to sign up to becomce a demonstrator. This can be spent on anything in the catalogue you want (to a value of $155). 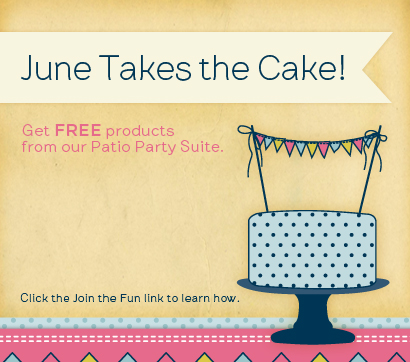 Not only that, but Stampin' Up will also give you an additional $60 in free items from the Patio Party Suite! Just click on the link to my Stampin' Store at the top right of this page and go to "Join the Fun" to find out the details!! Joining my team has never been SO worthwhile. Okay, take a deep breath...KEEP CALM and KEEP STAMPIN'!